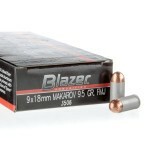 The 9x18mm Makarov cartridge is the Eastern Bloc counterpart to the 9mm Parabellum. Designed shortly after the end of World War II, it replaced the older 7.62x25mm Tokarev and was designed to operate in blowback pistols. 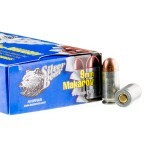 9mm Makarov ammo delivers good accuracy and terminal performance along with relatively mild recoil. 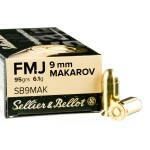 The firearm most commonly encountered in the US that fires 9x18mm Makarov ammo is the Makarov PM, a Soviet handgun that was the standard in the USSR from 1951 to 1991. 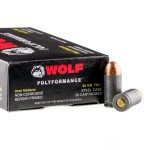 In the US, the PM has found favor with some users as an affordable carry or home defense pistol; though it lacks some "modern" features, it is a reliable and effective weapon. 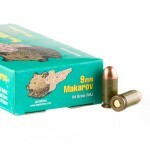 A typical round of 9x18mm Makarov ammunition fires a 95 grain bullet at a muzzle velocity of about 1,000 feet per second. 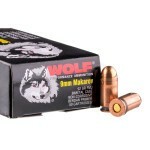 Most ammo for this caliber is still made in Russia (by Tula, Wolf, or Barnaul) using steel cases; this ammo cannot be reloaded or used at some indoor ranges, but is quite inexpensive and gives shooters plenty of trigger time for their dollar. 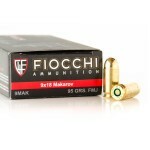 Sellier & Bellot, Prvi Partizan, and Winchester make brass cased range ammunition. 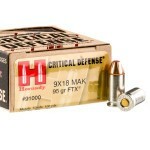 One notable 9x18mm Makarov load for defensive users is Hornady's Critical Defense ammo, which uses advanced FTX bullets to make the "Mak" a formidable choice for personal protection. 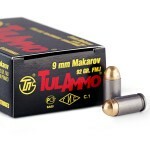 While the PM is by far the most common 9x18mm Makarov gun encountered in the US, a wide variety of other firearms have been chambered in the caliber. These include the PP-19 and Skorpion submachine guns as well as the Stechkin APS and CZ vz. 82 pistols.